Strikingly ugly and bald, with a thick powerful bill, the Marabou stork is unforgettable. But what is that naked pink pouch that sometimes appears hanging under its bill? This gular sac has two purposes: it helps keep the stork cool, as the skin has a dense concentration of blood vessels. It’s also a show-off device. In the breeding season, the male Marabou stork inflates the sac to impress rivals and prospective partners. The female will inflate hers in return. They also have a second air sac, small and normally hidden by feathers at the back of the neck, which swells like a red bubble during a display. The magpie, along with other members of the crow family, is often reviled and the object of superstitious beliefs. This interesting extract from The Naturalist of Norway by John Bowden, published in 1869, shows how attitudes to birds can vary among cultures, including within Europe. 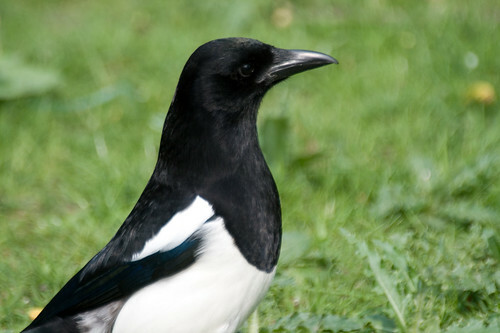 The magpie is common in all parts of Norway. It is a special favourite among the peasants who would not harm it on any consideration. The Lapps esteem it highly, and do their best to entice it about their tents. During the long and wearisome winter of Norway, the magpie is to the Norwegian bönder what the redbreast is to the country people of England. This bird is allowed to come into the peasant’s cottage; it is regularly fed, and if any mischievous person were to molest it, he would bring down a storm about his ears which he would not forget in a hurry. In country districts here, the people put hens’ eggs under the magpie and consider the chickens hatched in such a way will be prolific layers. When this is done, the magpie is carefully watched at hatching time, and the chickens are removed as soon as they come out of their shells, otherwise the magpie would devour them.